Everyone will be envious when you whizz past on this beautifully-designed pedal go-kart. The Jeep® Adventure is a light and compact pedal go-kart letting you travel the narrowest paths with ease. The unique BFR system ensures that you can brake with your pedals, and after coming to a halt, you can immediately pedal backwards! • Compact and light design; small, maneuverable, and yet suitable for children 4 years to 12 years old. • Grows with you due to the adjustable steering wheel and adjustable seat. • The pneumatic tires ensure extra comfort. 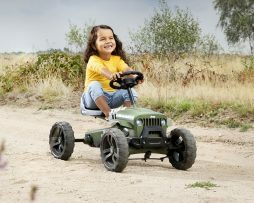 The Jeep® Junior Pedal go-kart is for the younger adventurers! 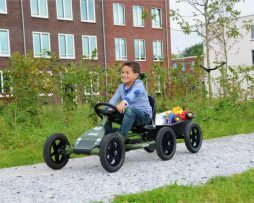 This pedal go-kart can tackle any surface thanks to its tough all-terrain tires. The seat and steering are adjustable, for years of playtime pleasure. This go-kart also has a unique BFR system, letting you brake with the pedals, and when you have come to a halt, you can immediately pedal backwards! • Extra comfort thanks to the pneumatic All-Terrain tires. • The Buddy accessories make this cool pedal go-kart complete. With the Jeep® Revolution you can take on any challenge! This sturdy go-kart has real off-road tires. Combined with the swing axle you race through every muddy puddle. The adjustable steering rods enable you to easily adjust the wheel positions, keeping wear and tear to a minimum. This sturdy go-kart has additional options to prepare you for any event, such as a spare wheel and a rollbar for added safety. This will always protect you from nasty surprises! Are you ready? Let the adventure begin! • Grows with you due to the adjustable seat. The BFR System– BFR stands for: Brake, Freewheel and Reverse. The BFR system allows you to brake using the pedals, but also reverse immediately after coming to a standstill. The E-BFR System – Provides pedal support by means of a 250W E-Motor. The harder you pedal on this go-kart, the harder you go. Let your child dream, do and discover in a real Jeep! The Jeep Buzzy Rubicon is a true off-road sensation. The off-road tires, round steering wheel with spinner knob, and cool hood with grill make this a real Jeep Rubicon. The 4 EVA tires ensure this robust Jeep Buzzy is firmly grounded. The good connection between the front and rear axles makes pedaling easy, even for little ones. This Jeep is suitable for children from the age of 2 to 5 years. Max User Weight: 66 lbs. Learning to pedal has never been so easy. Have older kids? Check out our Jeep Jr and Jeep Adventure! Adults and teenagers? 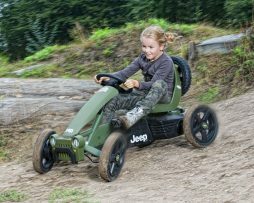 Check out our Jeep Revolution Pedal Kart! Let your child dream, do and discover in a real Jeep! The Jeep Buzzy Sahara is a true off-road sensation. The off-road tires, round steering wheel with spinner knob, and cool hood with grill make this a real Jeep Sahara. The 4 EVA tires ensure this robust Jeep Buzzy is firmly grounded. The good connection between the front and rear axles makes pedaling easy, even for little ones. This Jeep is suitable for children from the age of 2 to 5 years. Max User Weight: 66 lbs. Learning to pedal has never been so easy. Have older kids? Check out our Jeep Jr and Jeep Adventure! Adults and teenagers? 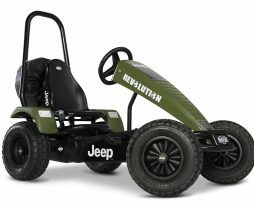 Check out our Jeep Revolution Pedal Kart!